Maintain Visibility: how can you identify issues when activities and other records are scattered? A number of our customers rely on Salesforce.com, and prefer their CRM to house all business critical data. However, we also speak with folks who rely heavily on Asana: a task management tool enabling teams to work together effortlessly. Marketing initiatives can be shared and assigned across teams, while sales-critical tasks can be prioritized and completed. Working across multiple tools, however, means *customer data and internal activities are segmented across Salesforce and Asana. * This makes it a challenge to clearly understand how teams are performing, which tasks were completed to close a deal, and what changes should be made. Say a sales opportunity is created in Salesforce. This action automatically triggers a project in Asana with a set of tasks for sales and support follow up. Those tasks, once completed, are then recorded at the opportunity level in Salesforce. Teams find this solution improves efficiency and makes it easier to measure performance across teams. It’s easy, it's flexible, and it’s powerful. At tray.io, we want your tools to work the way you want. 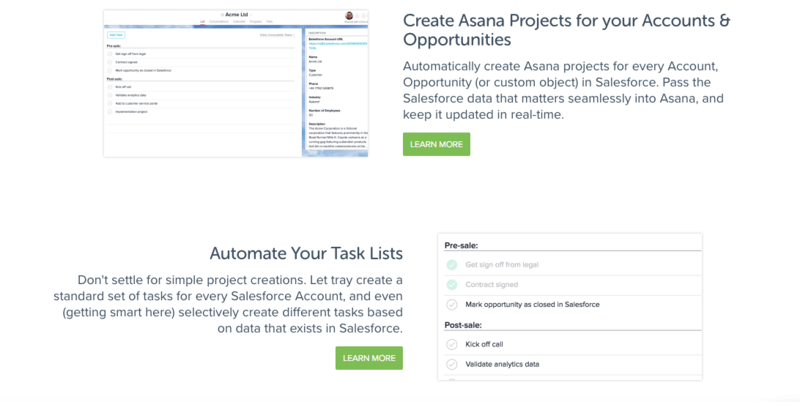 To learn more how others use this solution to optimize Asana and Salesforce, drop me a note.